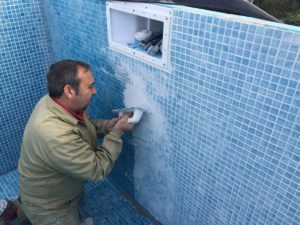 Before explaining how to waterproof a polystyrene pool, it is important to note that expanded polystyrene pools are a new system for building very light, thermally insulated pools. They also greatly simplify curved construction. Polystyrene is also one of the most versatile and innovative materials in the Pool & Wellness sector. 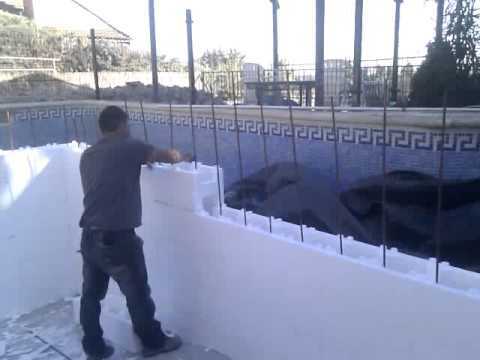 There are two types of polystyrene pools: self-supporting polystyrene and those that are built with blocks of concrete-filled polystyrene. In both cases, as a result of knocks, small movements and water pressure, micro cracks form very easily in traditional cement waterproofing systems. It should also be noted that the connection between PVC/ABS fittings and polystyrene or concrete (in polystyrene block fittings) is not waterproof and can cause problems. 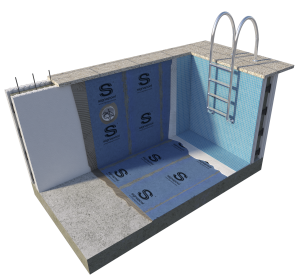 The Signapool system for waterproofing expanded polystyrene pools ensures the seal even if there are small movements as the sheet stretches up to 40% and can withstand cracks of up to 3mm. The Signapool system also ensures waterproofing between the Signapool S1 sheet and fittings with the EPOGROUT epoxy adhesive sealant. The grout used with normal tiles (cementitious) is not impermeable and after a few years it decomposes and/or mold can grow. This is because the chemical resistance of the cementitious grout is very limited. In addition, the cement-based grout is not waterproof and allows the water to pass through the joint. In this article, you can find more information about pool grout. After placing the glass mosaic over the Signapool waterproofing system, we recommend grouting the tile with Signapool EPOGROUT (epoxy mortar) for greater security. With the Signapool waterproofing system, as a complete system, you have the option of making the pool even more secure by using the epoxy grout. It is 100% waterproof, has a lot of chemical resistance (whether the pool uses normal or saline chlorination) and it does not fade over the years. In addition, the EPOGROUT epoxy grout is very easy to apply (almost like a cement-based grout).